In the wake of FAU’s win over USF, Carl Pelini mentioned how important it was to win a game in such a heavily recruited area for the Owls. Tuesday morning, Alonso (Tampa, Fla.) wide receiver Derius Davis committed to FAU. Davis, who tore his ACL in the spring, decided that the time was right and he wanted to give a verbal pledge to the Owls. “I called coach [Jeff] Sims and pretty much told him that I really like how the offense is and that I was excited about the opportunity to actually get to play,” Davis said. The 6-foot-2 wide receiver had been hearing from the likes of Duke, Georgia Tech, South Alabama, and Syracuse before a knee injury derailed things. Davis was competing at a 7-on-7 tournament in May, when a wrong step resulted in a torn ACL and meniscus. The injury left Davis without a lot of options, but FAU reached out to him in the summer. The coaching staff asked Davis to workout at a developmental camp, and despite a recent surgery, he gave it his best. “They had been in contact with me since June and I went and camped there and ran the routes. From there on I pretty much leaned towards them because I liked the campus and I could see what they’re trying to build,” Davis said. Davis spent the entire offseason rehabbing his knee and was just recently cleared to play in the first game of his senior season. “Coaches would always say that I would never play high school football again, but it was pretty much like a tough mental test for me. I knew where I needed to be and how I could get there,” Davis said. The wide receiver caught 14 passes for 326 yards and four touchdowns his junior season while also notching 29 tackles and one interception on defense. 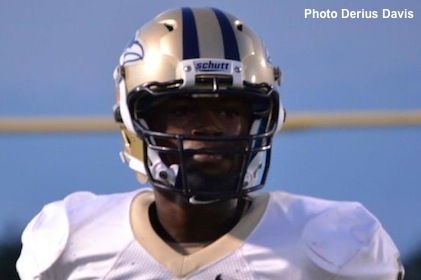 He becomes the second commitment this week for FAU and the 9th verbal pledge for the class of 2014. His highlights can be seen here.